Maximize natural light with the Primed Colonial One Lite Door with White Laminated Tempered Privacy Glass. With a high level of privacy, White Laminated glass is a versatile alternative to a panel door. This fresh design compliments many décor styles and can be used on all doors throughout your home. Milette Doors are proudly made in Canada with over 50 years of manufacturing expertise. We use only premium quality North American wood harvested from sustainable resources. 32-inch x 80-inch Primed 4 Lite Shaker French Door with Satin White Privacy Glass One of the most in demand trends in interior home finishing's is the Shaker door profile.With its simplistic style and clean lines the Primed 4 Lite Shaker French Door compliments multiple interior design themes.Satin White glass filters light while maintaining privacy making it a multipurpose door that can be used for any room throughout the home.Milette Doors are proudly made in Canada with over 50 years of manufacturing expertise.We use only premium quality North American wood harvested from sustainable resources. 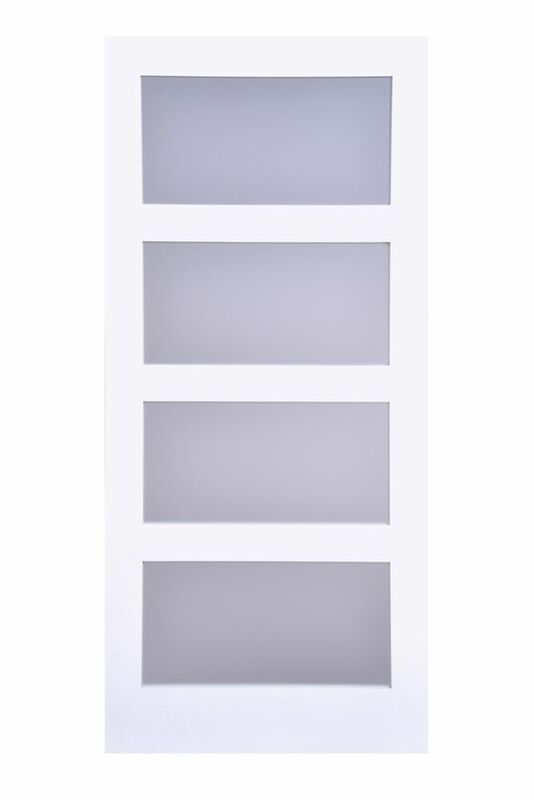 32-inch x 80-inch Primed 4 Lite Shaker French Door with Satin White Privacy Glass is rated 4.1 out of 5 by 7. Rated 2 out of 5 by 4tire from Awful privacy glass treatment. All doors the same. I now have bought 5 of these doors over 2 purchases spanning 2 years and all of them have defects in the privacy treatment applied to the glass. The problem is that there is no way to know until you have brought the doors home, painted them, and removed the plastic filmic the glass is good. By that time, you spent hours with the doors and it’s a painful process to bringing them back. Milette doors are usually great but, after 5 of these primed doors with the privacy glass, it’s very disappointing. Rated 5 out of 5 by mich from Outstanding! I bought these doors to add some elegance to the second floor of an older home. The panels provide the privacy while at the same time allow the light to come through. This lights up what was once a dark hallway. The Shaker style is excellent...clean lines. Overall an excellent product! Rated 3 out of 5 by WifeWithDoorIssues from For my office We bought this door within the last year. The quality is not what I wanted, but my husband brought it home and was not going to return it (period). It looks like particle wood frame, at times it even looks laminate because there is no wood grain obviously. It doesn't match our home, because everything else is wood (doors, cabinets, flooring, etc). It would work well in a home less traditional than ours. I only asked for a glass door for my office, thinking there was not too many options, and assuming my husband would purchase one to match the previous one. My bad. Also, the protective film we removed from the glass has left permanent streaks across each panel, I've never been successful in removing them. (Any suggestions welcome - I'm a clean freak and this door drives me nuts because it always looks dirty now). There is also other debris from the packing stuck on / in the glass somehow. Maybe we just rec'd a defective product, I'll never know though because my husband refuses to remove the door and take it back - and it's not worth a fight with him over it - but if you're picky like me - don't let your husband go to the hardware store and pick out the door - unless you have the ability to take it down yourself and return it if dissatisfied. Rated 4 out of 5 by bowzy from What a mess! I'm not sure if I got some kind of defect with my door, but when it came to peeling off the plastic on the windows things got really messy. The paint that was sprayed onto the plastic from the priming stage flaked off in thousands of tiny strands. Not sure if this is supposed to happen. Either way it just takes a bit of time with the vacuum to clean things up. Anyways, the door turned out really nice, we installed it in our laundry room which has a window in it. Lets in lots of extra sunlight to the hallway while hiding the clutter! Just would of liked to not deal with the messy aftermath of the plastic removal. Rated 5 out of 5 by YYC4RENO from YYC4RENO These doors are excellent quality and look better installed than expected. Also ordered bi-folds special order for two closets and they look equally great. How much does this door weigh? Hi Lmerr, This door weighs 44.63 lbs. All door weights are conveniently located under the Specifications section of each Milette Doors product. Is this door available in 36&quot;? Hello, Yes, Milette Doors are compatible with most types of sliding tracks such as: barn door tracks, bypass tracks and pocket door kits. Check the hardware manufacturers weight limits and ensure this door will not exceed it. Would this door provide enough privacy to be used as a bathroom door? Our bathroom is windowless so we are looking to bring some natural light into the bathroom while still maintaining privacy , i.e.without seeing shadows, outlines, etc.